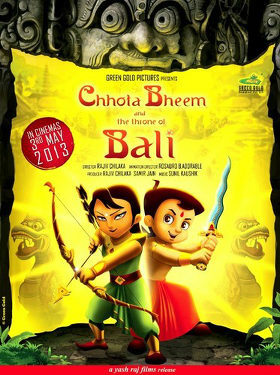 Bheem (‘chhota’ means ‘brave’ in Hindi) is a super-strong 9-year-old boy in the fictional rural city of Dholakpur who has magical adventures with his playmates (both friends and bullies). One of his friends is Jaggu, a talking monkey, and Throne of Bali features numerous anthropomorphic monsters (watch the trailer); so the movie definitely qualifies for Flayrah. Update: So it's still playing. The Indian animation newsletter "Animation Xpress" has an interview in its January 29, 2014 issue with Bharath Laxmipati, Vice President – Distribution & International Sales at Green Gold Studio. “[AX] How many screens have you managed to capture? [BL] Initially, Big Cinemas gave us about 6 screens for the release. But due an unprecedented release of regional Indian movie during Pongal festival, we now have 4 screens for the 1st week. We will be playing at major cities Fremont, CA , Norcross, GA, Niles, IL and Edison, NJ where the Indian Diaspora gather in large numbers. We are positive that our screens will increase in the 2nd week. [AX] Please inform about the past box office collections of Chhota Bheem movies? Laxmipati also says that, “Our online store sells a lot of products to citizens in USA. For this release, we have teamed up with Reliance Big Cinemas to be reach theatres where Indians living in USA go for watching movies.” Apparently there is a larger Indian diaspora in the U.S. than I had realized.